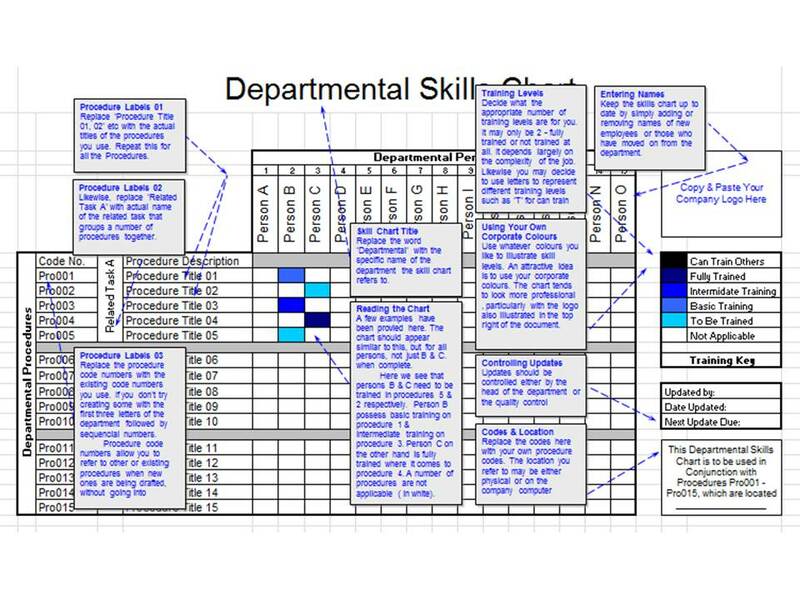 The Skills Chart Diagram is available as a handy Microsoft Excel spreadsheet. Additionally, it includes a ‘Skills Chart - Useful Tips’ section. It will soon be able to be directly downloaded. In the mean time why not send a blank email entitled 'Skills Chart' to info@advice-manufacturing.com and your free copy will be sent to you. Comprehensive advice to help you rapidly complete the skills chart is provided with the document. It is particularly useful for those completing the spreadsheet for the first time. Bear in mind the skills chart is a live document. As such, fill it in electronically as and when changes take place, in between the official update due dates. 6 monthly reviews may work, however, do what works for you. If you find that quarterly reviews are more appropriate, then feel free to complete and review the chart on a quarterly basis. Why not modify the format of the chart so it reflects the situation in the department? This may mean greater or fewer procedures or staff. Simply insert or delete rows and columns. A useful review exercise is to compare the last chart (or a number of past charts) with the latest one you have completed. This illustrates team progress over time as skills are obtained and training is undertaken. Speed up the completion of the chart even more by copying and pasting data from skills that haven't changed since the last review. Use the last sheet to do this. Always save skills charts in the same location on your IT network. Date the chart file names. Consider creating a digital folder to store all files. Give it a descriptive appropriate name. To control the document, think about making this a responsibility of the team leader or somebody with responsibility for quality. 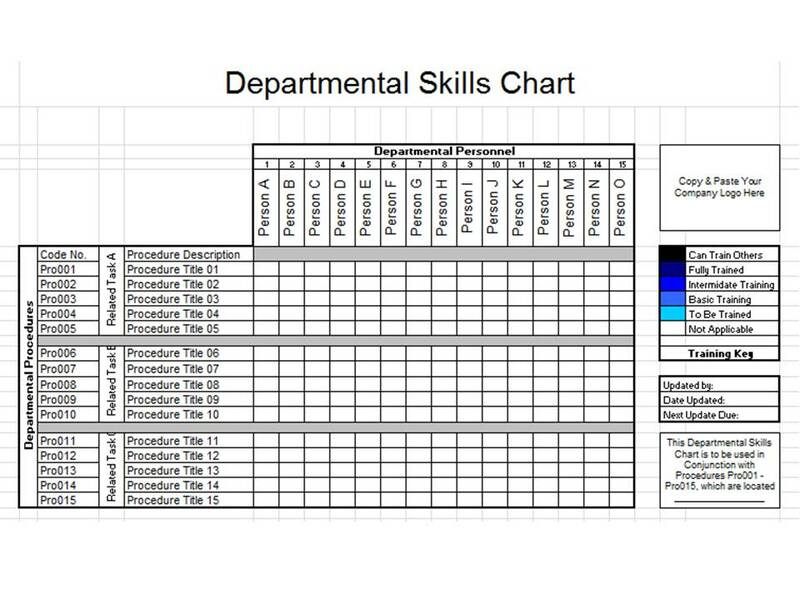 Try printing the Skills Chart out and enlarge it to A3 or larger. This increases visibility and looks inspiring on the team notice board. Importantly, staff will spot and discuss it. Generating debate and interest in this way will also motivate some staff to want to develop their skills further. Nobody wants to be last or least skilled. Link the chart to projects and procedures. This provides straightforward access. Do this by digitally linking the documents. Use the skills chart as the standard appraisal guide and document for your team. By doing this career development and skills / training progress can be co-ordinated and standardised (together with training log books - more later). The charts can also link into the 'Career Planner' as part of a personal development plan. Producing the Skills Chart for the First Time? This is an ideal project for a trainee or new employee to undertake. It is an excellent way of getting to know employees and understanding the various processes and procedures undertaken by the team. The new employee should undertake the project under the supervision of the team leader.